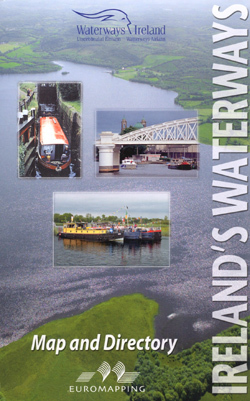 Ireland’s Waterways Map and Directory is a combination booklet and fold out map providing an introduction to the 1000km of the Emerald Isle’s inland waterways. The title includes navigational information for both the Republic of Ireland and Northern Ireland, as well as boat hire details and historical notes, and illustrates the waterway system both in use and derelict/under construction. The directory profiles the Barrow Navigation, the Erne System, the Grand Canal, the Lower Bann Navigation, the Royal Canal, the Shannon Navigation and the Shannon-Erne Waterway. 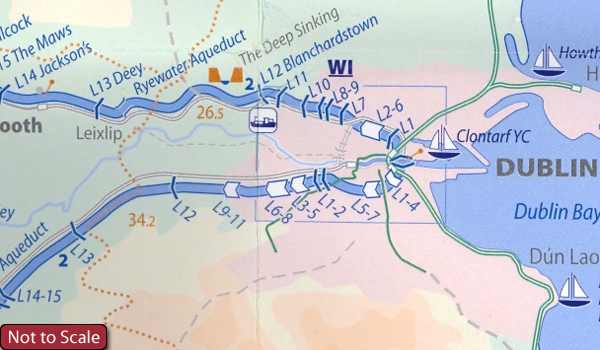 An overview description is provided for each waterway featured, with details given concerning the overseeing authority, navigable dimensions, lock operation and charges, slipways, serviced moorings, with additional navigation notes and the contact details for boat hire bases along the route. Map legend indicates navigable waterways including rivers (subject to tide), lakes and reservoirs (with channel indications) and canals. Legend symbols for canal locks show if the lock is a staircase lock or flight of locks. Distances in km are provided between two markers and navigable length, beam, depth and air draft dimensions are shown. Moorings with service blocks and limited facilities are shown and the locations of cruiser hire bases, sailing/boat clubs, marinas and Waterways Ireland Regional Offices are given. Aqueducts are displayed with cuttings, summit levels and altitude above sea level. Inset enlargements are given on the map of the canals and railways in Dublin, the Grand canal Lowtown Junction, the Shannon-Erne waterway and Lough Allen canal, the waterways around Galway, the Shannon navigation-Sluck navigation-Grand canal junctions, and the lower Shannon navigation waters. As well as detailing Ireland’s waterways the map also shows train lines, major parks or landscape features, sites of particular interest and county borders. Gentle colour relief shading marks heights at 300, 600, 900 and 1,200ft.